When the engine misfires, high concentrations of hydrocarbons (hc) enter the exhaust gas. Extremely high hc concentration levels can cause increases in exhaust emission levels. High concentrations of hc can also cause increases in the three-way catalytic converter (twc) temperature, which may cause damage to the twc. To prevent these increases in emissions and to limit the possibility of thermal damage, the ecm monitors the misfire rate. When the temperature of the twc reaches the point of thermal degradation, the ecm blinks the mil. 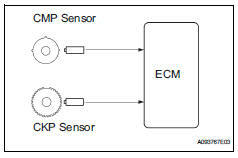 To monitor misfires, the ecm uses both the camshaft position (cmp) sensor and the crankshaft position (ckp) sensor. The cmp sensor is used to identify any misfiring cylinders and the ckp sensor is used to measure variations in the crankshaft rotation speed. Misfires are counted as when the crankshaft rotation speed variations exceed predetermined thresholds. If the misfire rate exceeds the threshold level, and could cause emission deterioration, the ecm illuminates the mil and sets a dtc. When dtcs for misfiring cylinders are randomly set, but dtc p0300 is not set, it indicates that misfires have been detected in different cylinders at different times. Dtc p0300 is only set when several misfiring cylinders are detected at the same time. The ecm illuminates the mil and sets a dtc when either of the following conditions, which could cause emission deterioration, is detected (2 trip detection logic). Within the first 1,000 crankshaft revolutions of the engine starting, an excessive misfiring rate (approximately 20 to 50 misfires per 1,000 crankshaft revolutions) occurs once. After the first 1,000 crankshaft revolutions, an excessive misfiring rate (approximately 20 to 50 misfires per 1,000 crankshaft revolutions) occurs 4 times in sequential crankshaft revolutions. 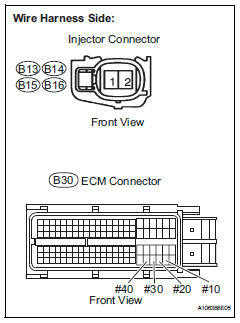 The ecm flashes the mil and sets a dtc when either of the following conditions, which could cause three-way catalytic converter (twc) damage, is detected (2 trip detection logic). In every 200 crankshaft revolutions at a high engine rpm, the threshold misfiring percentage is recorded once. In every 200 crankshaft revolutions at a normal engine rpm, the threshold misfiring percentage is recorded 3 times. 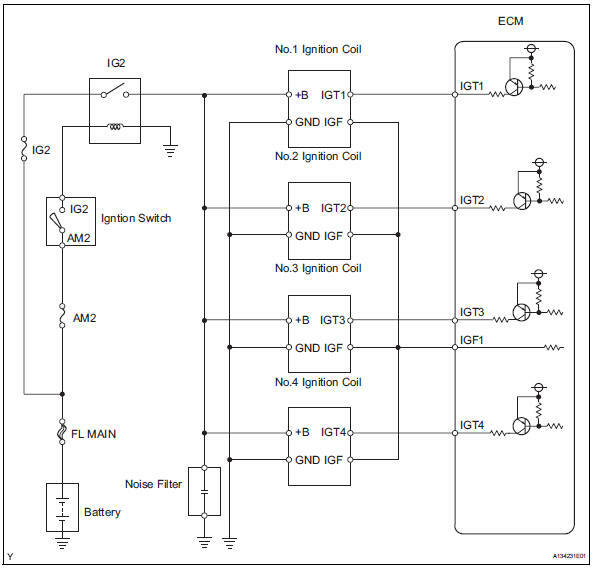 Wiring diagram of the ignition system. 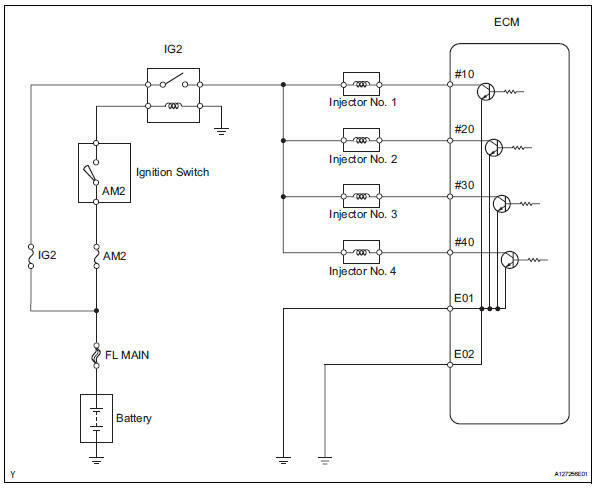 Wiring diagram of the injector circuit. Using the tester, switch the ecm from normal mode to check mode (see page es-38). Read the misfire counts of each cylinder (cyl #1 to #4) with the engine in an idling condition. If any misfire count is displayed, skip the following confirmation driving pattern. Drive the vehicle several times with the conditions, such as engine rpm and engine load, shown in misfire rpm and misfire load in the data list. 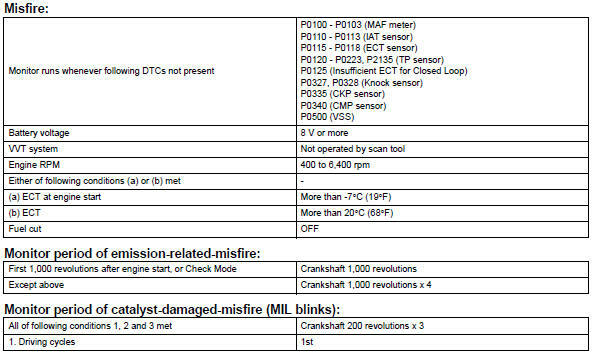 In order to store misfire dtcs, it is necessary to drive the vehicle for the period of time shown in the table below, with the misfire rpm and misfire load in the data list. Do not turn the ignition switch off until the stored dtc(s) and freeze frame data have been recorded. When the ecm returns to normal mode (default), the stored dtc(s), freeze frame data and other data will be erased. Turn the ignition switch off and wait for at least 5 seconds. If the misfire does not recur when the vehicle is brought to the workshop, reproduce the conditions stored in the freeze frame data. If the misfire still cannot be reproduced even though the conditions stored in the freeze frame data have been duplicated, one of the following factors is considered to be a possible cause of the problem: (a)the fuel level is low. (C)the spark plugs are dirty. (D)the problem is complex due to multiple factors. After finishing repairs, check that no misfires occur in each cylinder (cyl #1, #2, #3 and #4). Be sure to confirm that no misfiring cylinder dtcs are set again by conducting the confirmation driving pattern, after the repairs. For 6 and 8 cylinder engines, the ecm intentionally does not set the specific misfiring cylinder dtcs at high engine rpm. If misfires only occur during high engine rpm driving, only dtc p0300 is set. In the event of dtc p0300 being present, perform the following operations: (a)clear the dtc (see page es-35). (B)start the engine and conduct the confirmation driving pattern. (C)read the misfiring rates of each cylinder or dtc(s) using the tester. 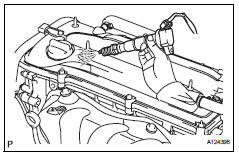 (D)repair the cylinder(s) that has a high misfiring rate or is indicated by the dtc. (E)after finishing repairs, conduct the confirmation driving pattern again, in order to verify that dtc p0300 is not set. When either short ft #1 or long ft #1 in the freeze frame data is outside the range of +-20 %, the air-fuel ratio may be rich (-20 % or less) or lean (+20 % or more). When the coolant temp in the freeze frame data is less than 75°c (167°f), the misfires occurred only while warming up the engine. Connect the intelligent tester the dlc3. Turn the ignition switch to on and turn the tester on. Select the following menu items: diagnosis / enhanced obd ii / data list / misfire / misfire rpm and misfire load. Read and note the misfire rpm and misfire load (engine load) values. The misfire rpm and misfire load indicate the vehicle conditions under which the misfire occurred. Select the following menu items: diagnosis / enhanced obd ii / data list / misfire / cyl #1, #2, #3 and #4. Read each value for cyl #1 to #4 displayed on the tester. Shift the gear selector lever to the d position. Check the cyl #1 to #4. And (i) and then check the misfire counts again. Drive the vehicle with the misfire rpm and misfire load noted in the "read value using intelligent tester (misfire rpm and misfire load)" procedures above. Read the cyl #1 to #4 or dtcs displayed on the tester. If it is difficult to reproduce misfires for each cylinder, check the data list item called misfire margin. Try to find vehicle driving conditions that lower the misfire margin value. Values above 30 % are considered normal. If the freeze frame data's record of the ect is below 75°c (167°f), the misfire may be detected only when the engine is cold. If the freeze frame data's record of the engine run time is below 120 seconds, the misfire may be detected immediately after the engine is started. Select the following menu items: diagnosis / enhanced obd ii / active test / fuel cut#1 (to #4). If a cylinder has a high misfire count, cut fuel to that cylinder. Compare the misfire count of the cylinder before fuel cut and after fuel cut. This active test cannot be performed while the vehicle is being driven. If the misfire count of the cylinder before and after the fuel cut are roughly the same, the cylinder is misfiring. If the misfire count of the cylinder before the fuel cut is lower than after the fuel cut, the cylinder misfires sometimes. 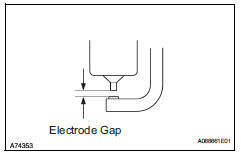 measure the spark plug electrode gap. Check the electrode for carbon deposits. If the electrode gap is larger than standard, replace the spark plug. Do not adjust the electrode gap. Remove the ignition coil from the cylinder head. Install the spark plug onto the ignition coil. Select the following menu items: diagnosis / enhanced obd ii / active test / fuel cut all. Attach the spark plug assembly to the cylinder head. Perform the fuel cut all operation (press the right or left button to change the on). When fuel cut all is off and the engine is cranked, fuel injection will occur. Crank the engine for less than 2 seconds and check the spark. Ok: sparks jump across electrode gap. Measure the cylinder compression pressure of the misfiring cylinder. Change the installed spark plug to a spark plug that functions normally. Always disconnect all injector connectors. Install the spark plug to the ignition coil and connect the ignition coil connector. Check if sparks occur while the engine is being cranked. 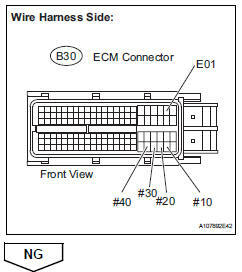 Measure the voltage between the terminals of the ecm connector. Disconnect the injector connector (of the misfiring cylinder). Measure the resistance and voltage between the injector and the ecm connector terminals. Check the injector injection (whether fuel volume is high or low, and whether injection pattern is poor).